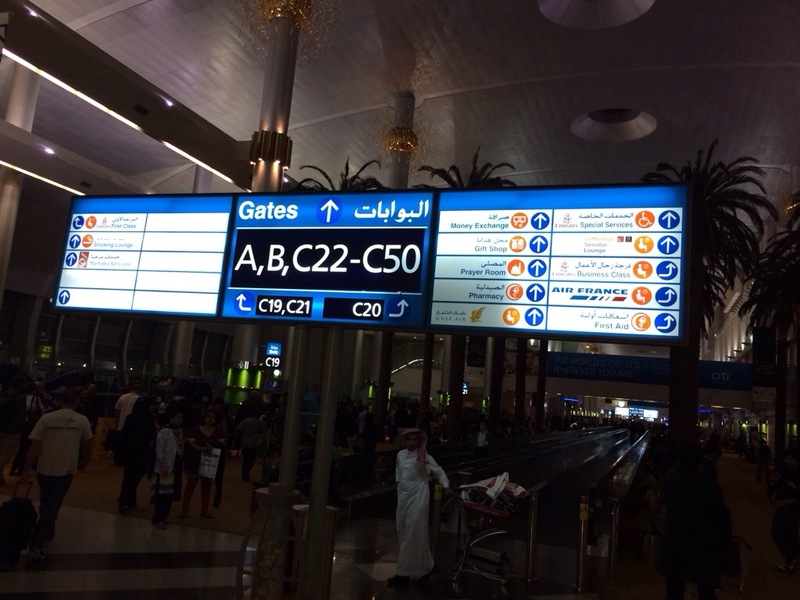 Dubai Al Maktoum International Airport consists of two terminals name creatively Terminal 1 and 3. United Airlines uses terminal 1, and shares this massive terminal with airlines such as Lufthansa, Emirates, Oman Air, Fly Dubai, Go India and a whole slew of carriers you don’t normally see here in the States. 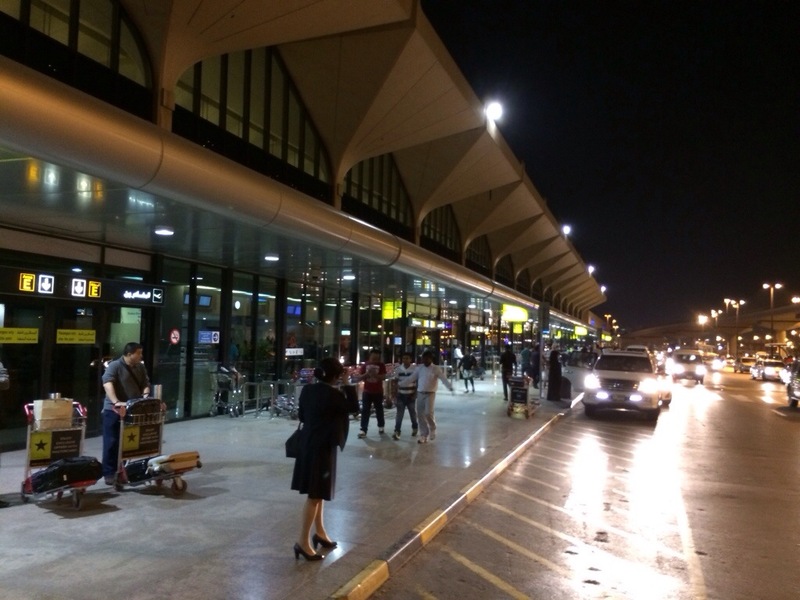 Comprised of two levels on the ground floor you have arrivals and the transportation hub for taxis, busses, hotel shuttles, foreign exchange and family meet and greet. 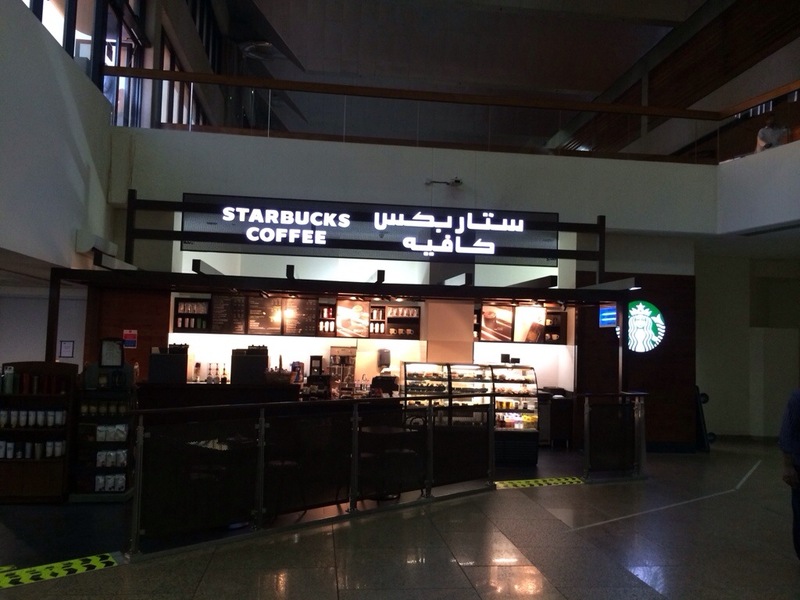 Additionally there’s a food hall with the likes of Starbucks and a Maharba Lounge, that offers internet and seating. Although I’m not sure what the criteria is to use this lounge. 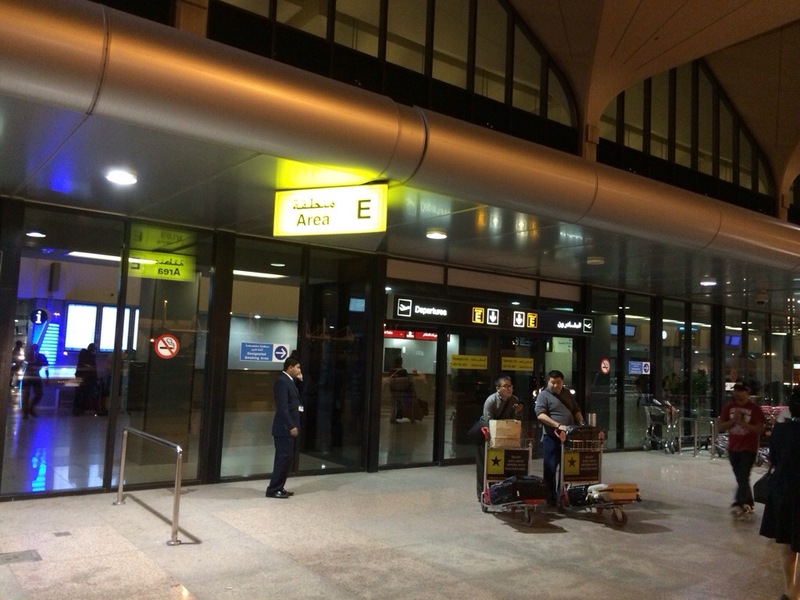 Also on this level by door E is a luggage storage area where you can leave your bags for 20 Dirhams per 24 hours (about 7 USD). They did have an extra charge for larger bags, although I don’t know what it is though. It’s also open 24 hours a day and seemed like a safe spot to leave stuff if you don’t want to lug it around the city or if you have a long layover. The main floor is where departures are. The terminal is broken out into lettered sections starting at A and going to at least E, I didn’t go further. There appears to be one security check point with customs and immigration as well. 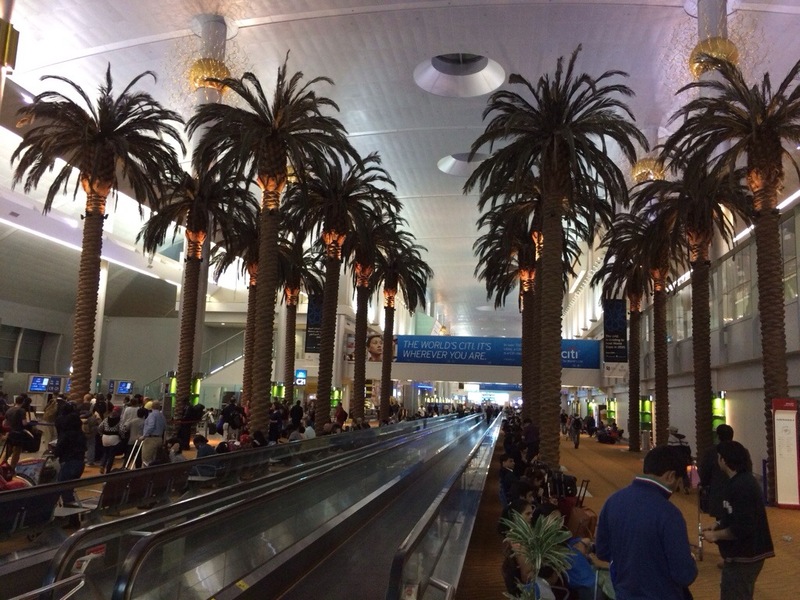 The check in facility is sort of a madhouse, with Dubai being so centrally located and offering so many worldwide one stop options plus being a jumping off point for so many contractors, military, and the like in the region there just seems to be a lot of hustle and bustle here. I was really expecting this airport to be pretty just like the city, but at least at this terminal inside and out I was not impressed. Don’t get me wrong it’s nice large and open, but I was expecting it to be on par with Singapore or Hong Kong and it was not. Again since I was in terminal 1, I didn’t get to see the other side terminal 3 which might just be better. 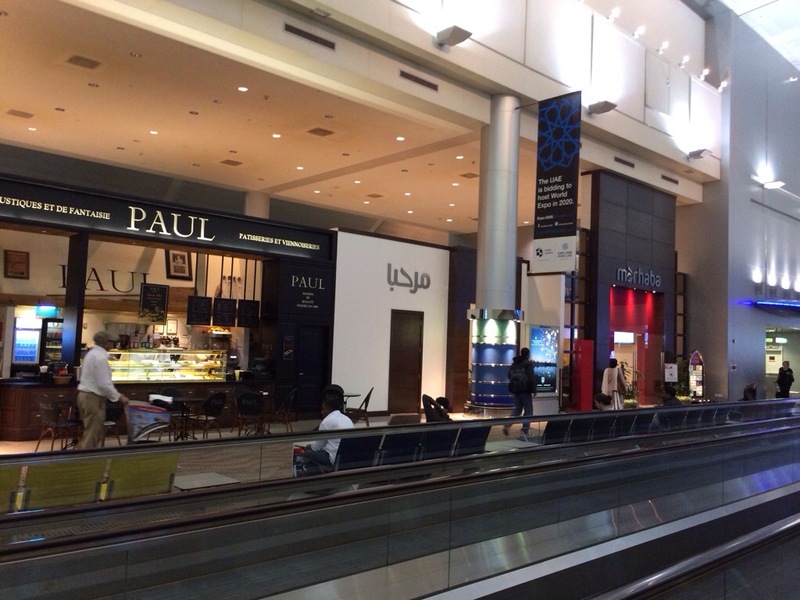 Also on the main level are escalators to the Dubai Metro that is very conveniently attached to both terminals. 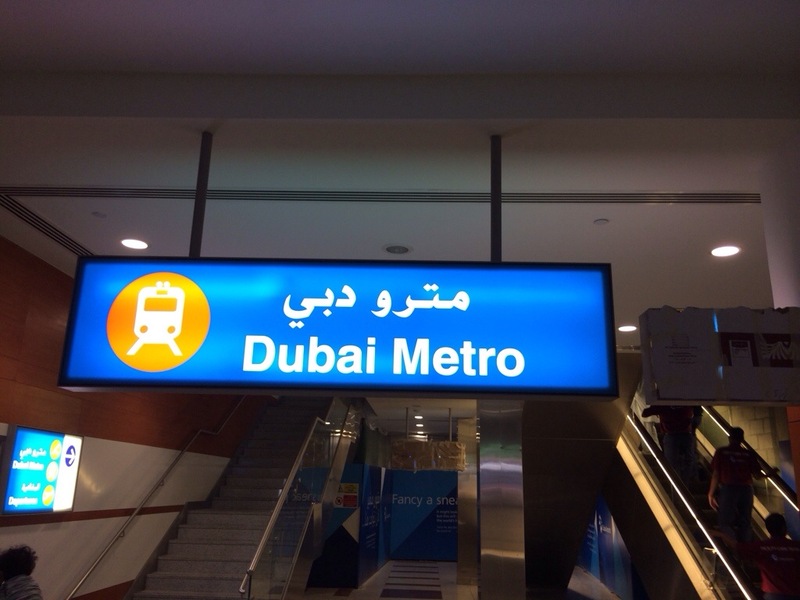 It’s a really great way to get in and out of the city and for 16 Dirhams you get a one day pass that gets you access to the metro and bus system. Not a bad deal for about 5 USD, which won’t even get me to SFO on Bart from my house one way. There are other ticket options, but for me this was the easiest one. Additionally when I needed assistance the gates at the terminals were more then glad to help me out. It was really great. Just be ready for packed trains since it appears many locals use it too. After check in, you have to navigate the customs and immigration area, which is pretty large but also very crowded, this is a 24/7 airport and there are flights leaving and arriving at all hours so it’s just busy. There was a Fastpass option if you were a premium passenger, sadly I didn’t qualify. So that meant long lines, that took about 30-45 minutes to navigate just to have your passport inspected and to clear customs and immigration. Think Costco on a Sunday times 10, at least the people were friendly and there didn’t seem to be much cutting, which can happen in some parts of the world. Once through customs you still have to clear security, so a trip through the metal detectors are in order, again more waiting and screening. The nice part here is only metal and cell phones need to come out of your pockets, I didn’t have to worry about liquids, jells or computers. Also I imagine if I was carrying a large water bottle they might say something. On a side note, there’s secondary screening at the gate too, where you again go through a metal detector and have your bags searched pretty well, and here you needed to take shoes off, in fact they thoroughly hand inspected them too. Finally though once through customs and immigration you’re free to move about the terminal. Inside the terminal there were two sets of the usual duty free stores with all the usual trappings, plus several spots selling local crafts and souvenirs. For me the duty free stuff didn’t seem cheaper then I can get at home, so I just moved on. Ironically since the country is supposed to be dry but many hotels and restaurants can and do sell alcohol the duty free area seemed pretty well stocked with popular brands of liquor. Otherwise there were lots of restaurants including a Nestle ice cream shop, Paul’s, McDonalds and Texas Chicken. It’s just funny seeing so many US chains outside of North America. If you’re a lounge whore like me, you have many to choose from including Lufthansa Senator lounge, Emirates first and business class, Delta/KLM, Oman Air, Air France and several contact lounges for many other carriers including two Priority Pass ones too. Stay tuned for my photo review of the uber tiny Senators Lounge. A couple other data points, if you are a transit passenger, once you deplane you can most likely get a copy of your ongoing boarding pass at the transit area, airside. Although if you have a long layover like me try and get it printed prior since it’s possible there may not be someone to print it depending on who you’re flying. I also found they like the real boarding passes, and my print at homes were not acceptable not sure why. With my onward boarding pass I had the option of hanging out in the terminal prior to leaving the airport, which let me get in a shower after my 13 hour flight. Otherwise I would have had to immediately go to immigration and not have been able to stay airside. Then when I was ready to leave the airport, I went back up to the transfer area and the security agents there let me back through so I could head to customs and immigration and enter the country. This process was super simple, but it was because I had a onward boarding pass, without it, I don’t think this would have worked. 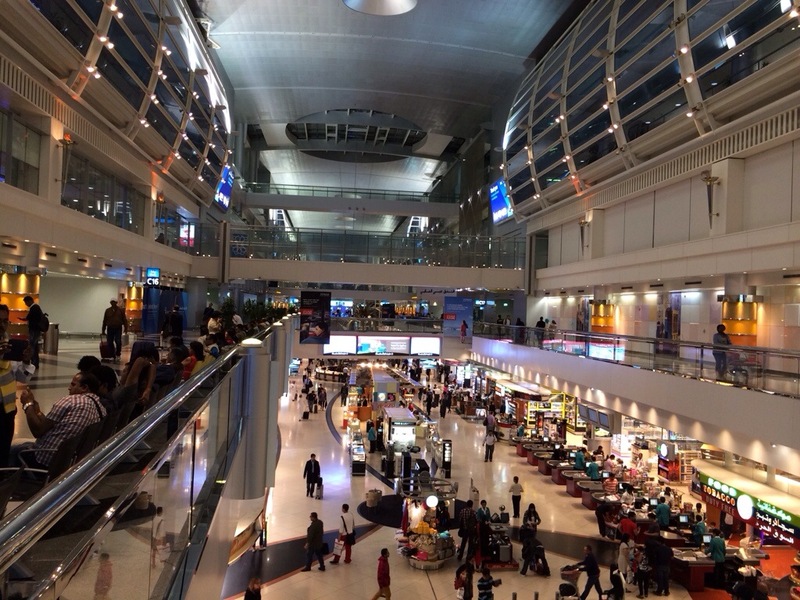 Overall DXB terminal 1 is not to bad, if you have to hang out someplace for a few hours you could do worse, is it my favorite airport, no but it’ll do, and I’ll be happy to transit it again. Previous Can I wear these shoes? In India you have a large variety of destinations to choose from to spend your hard earned vacation. 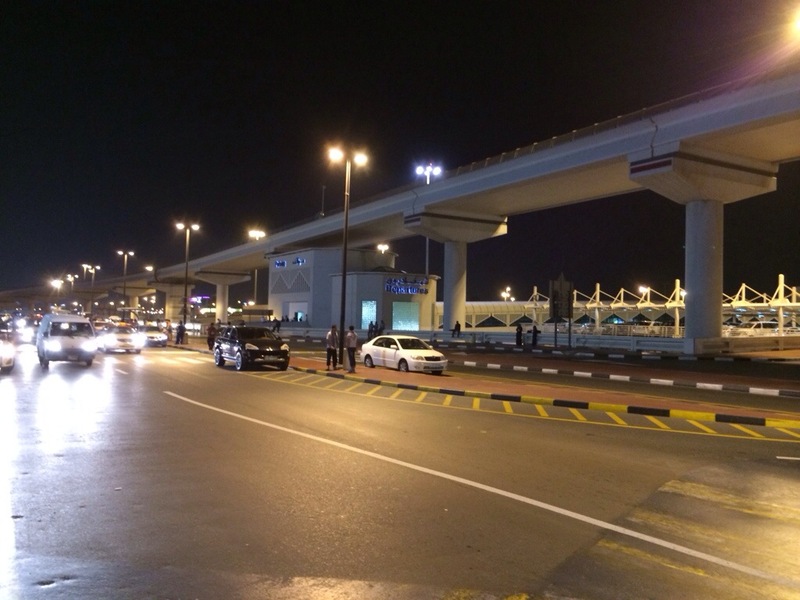 this is DXB, not DWC (Al Maktoum)! Thank you for the clarification got my airport codes mixed up.